Conjuring up a jackpot is the goal in the hugely volatile Street Magic video slot from Play ’N Go. It’s a 5 reel, 20 payline game that comes with spins with 4 added wilds, stacked reels and a free spins round with sticky wilds. Play on your PC, tablet or mobile from between 20p and £100 per spin. Don’t expect to see a dapper conjurer in top hat and tails here. The star of this video slot owes more to David Blaine than Paul Daniels. The plain purple reels feature heart, diamond club and spade symbols alongside handcuffs, daggers with playing cards, padlocks and pocket watches. The ring is the best paying symbol, awarding 25 times your total bet if you land 5 on a payline. The Wild Shuffle – an extra 4 wilds are added to greatly boost your chances of landing a winning combination. The Expanding Man – the 2 street magician scatters expand and fill the whole of the reel, turning wild as they do. A new payout is made with the stacked wilds in position. The Transporting Man – the 2 magicians are joined by a third which in turn triggers the Free Spins feature. 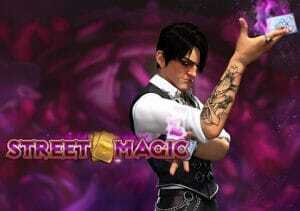 You can also trigger the Free Spins feature by landing 3 street magician scatters on the same base game spin. You can then look forward to 8, 10 or 12 free spins. Any wild that lands during the free spins locks in position for the remainder of the feature. If you manage to get at least 1 sticky wild on each reel, you’ll also be awarded a free spins re-trigger. Pick from the selection of playing cards which determines whether you’ll receive another 4, 6 or 8 free spins which can take your potential total to 20. This isn’t the most dazzling video slot you’ll see as far as design goes. It’s an explosive one as far as variance is concerned though. The volatility here is as high as you’ll find anywhere. Expect some lengthy spells where your bankroll will disappear to dust. If the wild extras work their magic, you can conjure up plenty of treasure in the blink of an eye – you can win up to 5,000 times your bet on each spin. We enjoyed Street Magic. The super high variance won’t be for everyone. If you can cope with the potentially big swings then there’s plenty to like from this performance. Alternatively, Rise of Olympus and Sizzling Spins by Play ‘N Go are very good and high variance.